The Ok Tedi copper and gold mine in Papua New Guinea has discharged more than two billion metric tons of tailings, overburden, and waste rock into the Fly River system since the mid-1980s, polluting the river corridor from the mine to the sea, a distance of one thousand kilometers (Tingay 2007, 5). Nearly two thousand square kilometers of rain forest and savannah along the river have been affected by flooding and die-back (OTML 2005, 4). The pollution is eventually expected to transform the entire floodplain, approximately 3,800 square kilometers, an area larger than the U.S. state of Rhode Island (Tingay 2007, 12). Until recently, the Fly River system was the site of one of the largest extant rain forests in the world and valued for its high biodiversity (Swartzendruber 1993). The project has already caused acid mine drainage at several locations, which has the potential to render large areas inhospitable to organic life for centuries. Large-scale resource extraction projects like the Ok Tedi mine are usually dominated by distant capital and primarily responsive to international markets. Economies of scale often dictate the enormous size of hard rock mines, especially when located in remote and rugged terrain. Mining is an intensive process that focuses on a single type of resource, which it eventually exhausts. Without adequate protection, the environmental impact from these mines may extend over great distances. Yet pressure from international markets discourages mining companies from making sufficient investments in environmental controls. The absence of binding international standards for handling tailings and other mine wastes leads mining companies to pursue a "race to the bottom" for environmental standards. Mining companies lack incentive to voluntarily raise these standards, given that only those producers with the lowest costs remain profitable during economic downturns. The environmental impacts of large-scale resource extraction projects may also pose a threat to the continued viability of indigenous subsistence practices, a dynamic I refer to as "colliding ecologies." When competing systems for exploiting natural resources interact, one system may limit the viability of the others. The environmental impact of the Ok Tedi mine has had significant consequences for the forty-five thousand people living downstream whose livelihoods depend on access to natural resources. Until relatively recently, the diets of the peoples living in the region were entirely dependent on local subsistence production. They were also extensive, making use of a broad array of resources, combining horticulture with hunting, fishing, and the gathering of a broad array of forest products. In the cloud forests of the Star Mountains, where the Ok Tedi mine is located, taro is the staple food of the Min (Barth 1983; Crook 2007; Hyndman 1994). In the lowland rain forests of the North Fly, the Yonggom and their neighbors harvest sago from the Metroxylon palm and cultivate bananas (Depew 1987; Kirsch 2006; Welsch 1994). In the savannah and lagoons of the Middle Fly, the Boazi and their neighbors rely on sago, hunting, and fishing for the bulk of their diet (Busse 1991). In the rain forest and mangroves of the South Fly, the Kiwai and their neighbors depend on sago and fish (Lawrence 1991; Ohtsuka 1983), whereas yams are the staple crop of the people living in the dry interior (Ayres 1983). These practices are compatible with a variety of other economic activities, including smallholder rubber plantations, commercial fishing, and the cultivation of cash crops. However, pollution from the Ok Tedi mine has transformed the downstream environment in ways that compromise both subsistence production and other economic opportunities. The harsh treatment of land and other resources set aside for production is commonplace for the residents of industrialized countries, but the new landscape downstream from the Ok Tedi mine is alien to the people living there. Rivers that once ran green and clear have been transformed into muddy torrents the color of coffee with milk. Three decades of mining have transformed the verdant landscape along the river corridor into a moonscape of gray tailings. The hornbills, cockatoos, egrets, kingfishers, and birds of paradise that used to live along the river and in the forest are gone. Fish populations have been drastically reduced in number and biodiversity. Sago stands along the river and in nearby creeks have long since been choked by mud. The pollution of the river, the death of the forest along the river corridor, and the disappearance of the animals that used to live in the forest have given rise to widespread concerns about environmental collapse. The destruction of the landscape has also evoked profound expressions of sorrow and loss from the people living along the river. The concept of colliding ecologies suggests an alternative way of conceptualizing what economists call the "resource curse," the recognition that developing countries dependent on mining and other forms of natural resource extraction possess slower growth rates than their peers (Auty 1993; Sachs and Warner 1995; Ross 1999). The resource curse not only causes macroeconomic problems at the level of the state, but it also creates microeconomic problems for the peoples most directly affected by mining. Even though new mining projects are routinely promoted on the grounds that they will raise local standards of living, in practice, the people living in the catchment areas of these projects end up bearing a disproportionate share of their costs-in the form of environmental impacts. Instead of benefiting economically from mining, many of these communities are impoverished by pollution, an example of "accumulation by dispossession" (Harvey 2003). I begin this chapter by examining the history of the Ok Tedi mine and the reasons why its impacts have vastly exceeded the project's original environmental impact assessment. Next, I compare the macro- and microeconomic consequences of the resource curse. I focus on the consequences of the Ok Tedi mine's environmental impact for the Yonggom people, with whom I have carried out ethnographic research since 1986, including their perceptions of these changes. Finally, I show how these events have analogues elsewhere in the region by briefly describing several other prominent mining conflicts in Melanesia. In addition to using this exercise for its comparative value, I explain how these conflicts are interrelated. This chapter also seeks to place the Ok Tedi mine in its proper historical context as one of the first conflicts between mining companies and communities to gain international prominence. As I argue more fully in succeeding chapters, the Ok Tedi case not only contributed to the internationalization of debate about the mining industry, but it also led to significant changes in the industry's practices, triggered a series of lawsuits against transnational mining companies, alerted multilateral banks and other international financial institutions to the problems caused by their funding of the Ok Tedi mine and other mining projects, and led to new roles for indigenous peoples and NGOs in relation to mining conflicts around the world. Ok Tedi was the first mining project approved by the postcolonial government of Papua New Guinea, which acquired its independence from Australia in 1975. The flagship development project of the colonial era was the Panguna copper mine in Bougainville, which, during its operation, provided more than 16 percent of the postcolonial state's revenues (Griffin 1990, 70). After independence, Papua New Guinea continued the colonial policy of pursuing economic development through large-scale resource extraction projects (Filer and Macintyre 2006). Kennecott exploration geologists discovered the ore body at Mt. Fubilan in 1968, nearly a century after the Australian engineer Lawrence Hargrave found copper and gold while panning in the lower Ok Tedi River in 1876 (Goode 1977, 176). Negotiations between the state of Papua New Guinea and Kennecott failed, however, in 1975, and several years later, in 1980, the Australian mining company Broken Hill Proprietary Ltd. (BHP) took the lead in establishing a consortium of investors to develop the project. The Australian government was eager to see the project move forward as a means of reducing its financial obligations toward its former territory and offered BHP tax credits for exploration and other financial support for developing the mine (Pintz 1984, 56). This was the first major international venture for BHP, which had previously concentrated on domestic investments. Its participation in the Ok Tedi mine coincided with the rapid internationalization of the company, which culminated in its 2001 merger with the Anglo-Dutch mining company Billiton PLC. BHP Billiton currently operates in twenty-five countries around the world and describes itself as the "world's largest diversified resources company," producing aluminum, bauxite, coal, copper, diamonds, iron ore, lead, manganese, nickel, petroleum, silver, steel, uranium, and zinc (BHP Billiton 2006). The Ok Tedi mine is located in the Star Mountains, eighteen kilometers from the border with the militarized Indonesian territory of West Papua. In 1982, when construction began, this was one of the least accessible areas of Papua New Guinea. At the start of mining, Mt. Fubilan stood 2,094 meters high (Pintz 1984, 13), but the elevation of the mining pit will drop below sea level during the final phase of the project, which is expected to last from 2015 to 2025. The terrain is composed of rugged limestone karst. With annual rainfall in excess of ten meters, this is one of the wettest areas in the world, which proved to be a critical factor in the erosion of waste rock and overburden into the river system. The ore body is located near the headwaters of the Ok Tedi River, which runs south for about 190 kilometers to D'Albertis Junction, where it joins the Fly River, forming the largest wetland system in the country. The volume of water transported through the Fly River system per square mile of catchment area exceeds even that of the Amazon River (Townsend and Townsend 1996, 1). The river system once supported the most diverse assemblage of freshwater fish in the Australasian region, with 115 species, including seventeen endemic species (Storey et al. 2009, 428). In contrast, the Sepik River in northern Papua New Guinea, the river closest in size to the Fly, has a relatively low overall fish density, with a total of fifty-seven freshwater species (Hettler and Lehmann 1995, 15). The bird life along the Fly River was equally diverse, including tens of thousands of migratory birds that travel north from Australia during the continental dry season. The distinguishing feature of the ore body at Mt. Fubilan was a substantial gold cap, which was expected to pay for the bulk of the project's construction costs (Jackson 1993, 168).From May 1984 until 1988, the gold cap was mined and processed, which involved the use of sodium cyanide to separate the gold from the other metals and rock; gold bars were produced at the site and flown directly out of the country. In late 1988 the mine moved to full production in the second phase of development, producing copper concentrate, which is piped 160 kilometers to the river port of Kiunga on the Fly River, where it is loaded onto ships and transported to overseas smelters in China, Germany, India, Japan, South Korea, and the Philippines. During this phase of production, gold and silver are not separated from the copper concentrate, and consequently, cyanide is no longer used at the mine. There was always a question whether the second phase of the mine would be economically viable, although the state made its contract with the mining company contingent on the continuation of the project after the gold cap was exhausted. Over the history of the mine, BHP threatened to walk away from the project several times, exercising its political leverage over the state, which had become economically dependent on the taxes and other economic benefits provided by the mine. Papua New Guinea also had a strong interest in demonstrating to the international community that it was a desirable location for investment capital. BHP finally left the project in 2001, because the Ok Tedi mine's ongoing environmental impacts posed significant economic liabilities and reputational costs. However, at the insistence of the state, the Ok Tedi mine continues to operate, though without its international partners. Due to higher metal prices in the last decade, the most recent phase of the project has been by far its most profitable, with earnings of more than five billion dollars, a dramatic turnaround for a mine that performed so poorly during its early years of operation that BHP's original investment in the project had to be written off (Jackson 1993, 50). Although BHP was the managing partner of the Ok Tedi mine, it initially controlled only 30 percent of the project. German interests accounted for another 20 percent of the operation. This followed the decision by the German metals industry during the 1970s to secure access to raw materials through investment in foreign mining projects, which was supported by government financing and tax incentives (IWT 1994, Mining, 60). Metallgesellschaft, the largest minerals and natural resources company in Germany, which also has substantial international interests, acquired 7.5 percent of the project. Degussa, a large precious metals and chemical company, owned another 7.5 percent of the mine, giving the company access to copper for its refinery on the Elbe River, which was operated by its subsidiary Norddeutsche Affinerie, as well as a market for the industrial chemicals it produced, including hydrogen peroxide and sodium cyanide. The German export credit agency DEG, which ordinarily provides loans to development projects, controlled another 5 percent of the project (IWT 1994, Mining, 60). Amoco (originally Standard Oil Company of Indiana) was the final international investor, acquiring 30 percent of the project. The head of Amoco's minerals subsidiary had previous experience at the Panguna copper mine in Bougainville and was instrumental in Amoco's decision to invest in the Ok Tedi mine (Pintz 1984, 59). The Papua New Guinea state also assumed ownership of a 20 percent stake in the project. This decision was influenced by ideas about economic dependency that were prominent during the 1970s, most notably the argument that the wealthier core states of the global economy perpetuated their economic advantage by extracting raw materials from poorer and less-developed states in the periphery (Thompson and MacWilliam 1992, 170). By acquiring an ownership stake in the Ok Tedi mine, Papua New Guinea hoped to reverse this trend by reaping a greater share of the financial benefits from its natural resources (Zorn 1977). However, policy makers did not give adequate consideration to the contradictions engendered by this decision, notably that the state would have to negotiate a fundamental conflict of interest as both a shareholder and the regulator of the Ok Tedi mine. In particular, the scale of the new mining project in relation to the small size of the country's formal economic sector created a new form of dependency for Papua New Guinea on the Ok Tedi mine. Throughout the history of the project, the state has consistently made regulatory decisions that sought to minimize its expenditures and maximize its economic returns as both a shareholder in the mine and tax collector. Most of these decisions were made at the expense of people living downstream from the Ok Tedi mine. Financing for the $1.4 billion project was supported by a number of multilateral investment authorities and state export credit agencies, the purpose of which is to promote economic activity. The Australian government backed the mine with the largest export credit ever provided by its Export Finance and Insurance Corporation (Pintz 1984, 139). The Multilateral Investment Guarantee Authority (MIGA) of the World Bank provided guarantees that ensured lower interest rates on loans from New York-based Citicorp Bank. The U.S. Overseas Private Investment Corporation (OPIC) provided political risk insurance against the threat of nationalization (Pintz 1984, 140). The European Investment Bank and several export credit agencies in Europe also provided financial support given the German investments in the project (Pintz 1984, 140-41). In the early 1980s, these institutions lacked policies addressing the environmental impacts of the projects they funded or their consequences for indigenous rights, although this began to change in the late 1980s and 1990s as a result of lobbying and other pressure from the NGO community (Goodland 2000). Accordingly, the credit agencies and banks that financed the Ok Tedi mine lacked the legal standing or political capacity to intervene in decisions made by the mining company. Despite the large commitment of public resources to the project, civil society had little influence over the policies of Ok Tedi Mining Ltd. (OTML), even after the environmental problems caused by the mine had become pronounced and troubling. At its independence from Australia in 1975, the legal system of Papua New Guinea was still in the process of being drafted. Consequently, the Ok Tedi project is governed under a separate act of Parliament, the Mining (Ok Tedi Agreement) Act of 1976. Despite having one of the first constitutions in the world to make reference to environmental sustainability, the bill that enforced this provision of the constitution was not passed until 1979. This means that the Ok Tedi mine is exempt from the Environmental Planning Act. The original Mining Act has been modified nine times in separate agreements, each of which required parliamentary approval. The Ok Tedi mine is governed by these agreements, which have been influenced by the political concerns and often pressing economic needs of the state, rather than being regulated by the same laws as the rest of the industry. Although the transfer of responsibility for monitoring the Ok Tedi mine by the Department of Minerals and Energy, which is also charged with increasing state revenue from this sector, to the Department of Environment and Conservation in 1993 was intended to reduce the inherent conflict of interest, all of the major decisions about the mine continue to be made by the PNG Parliament, which must contend with competing priorities. In addition to repeated threats by the mining company to pull up stakes and abandon the project and the state's conflict of interest as both regulator and shareholder, these shortcomings in the governance of the project might be seen as a critical third strike in terms of undercutting the ability and motivation of the state to limit the mine's environmental impact. The question of waste disposal from the Ok Tedi mine has dominated discussion and critique of the project. Hard rock mines produce several different waste products. Tailings, or fines, are the finely ground materials, often sand-like in consistency, that remain after the valuable metals have been extracted from the ore body. Overburden refers to rock and earth moved to gain access to the ore body. Waste rock refers to materials that have been excavated but do not contain enough metal to be processed economically. The cut-off for processing, or head grade, is determined by a combination of technical capacity, production costs, and market prices for metals, and can change over the life of a mining project. Historically, this figure has decreased as metals have become more valuable and new technologies have been developed to extract particles that, in the case of gold, may be so small as to be invisible to the naked eye. For the Ok Tedi mine, the tailings consist of a fine slurry of ground rock containing varying amounts of heavy metals, including cadmium, copper, lead, and zinc, as well as small quantities of organic flotation chemicals (IWT 1994). The waste rock and overburden from the Ok Tedi mine consists of soft material that breaks down easily, with a copper content of 0.2 percent or less and significant quantities of other heavy metals (IWT 1994). More than one billion metric tons of waste rock and overburden have eroded into the river over the life of the mine (Tingay 2007, 5). Another 750 million metric tons of finely ground tailings have been discharged into the river system during this time. The initial proposal for the Ok Tedi mine included the construction of a dam in the mountains that was intended to prevent the tailings from entering the river system. But historically high gold prices encouraged the mining company to accelerate construction of the mine. Excavation for the foundation of the Ok Ma tailings dam, which was already several months behind schedule, commenced before the geological assessment of the site was complete (Townsend 1988, 113). On January 7, 1984, there was a landslide at the excavation site that destroyed the footings for the dam and prevented further construction (Townsend 1988, 114). Even though three independent reports suggested alternative sites for a tailings dam (Townsend and Townsend 2004, 13), the mining company immediately petitioned the state to begin production without a tailings dam. Anxious not to delay or jeopardize this important economic project, several weeks later the Papua New Guinea government approved an interim tailings scheme that permitted the mining company to discharge tailings directly into the Ok Tedi River. Under the terms of the Sixth Supplemental Agreement, which went into effect in 1986, OTML agreed to investigate alternative plans for tailings containment and report back to the state in late 1989. The Sixth Supplemental Agreement also made an important change to the earlier agreements, redefining the river system affected by the mine as the "Fly River below the confluence of the Ok Tedi and Fly River down to and including the delta of the Fly River" (Papua New Guinea 1986), treating the Ok Tedi River as a de facto sacrifice zone (Kirsch 1989b, 58). Corporations are among the most powerful institutions of our time, but they are also responsible for a wide range of harmful social and environmental impacts. Consequently, political movements and nongovernmental organizations increasingly contest the risks that corporations pose to people and nature. Mining Capitalism examines the strategies through which corporations manage their relationships with these critics and adversaries. 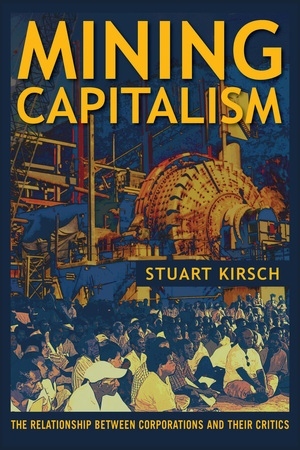 By focusing on the conflict over the Ok Tedi copper and gold mine in Papua New Guinea, Stuart Kirsch tells the story of a slow-moving environmental disaster and the international network of indigenous peoples, advocacy groups, and lawyers that sought to protect local rivers and rain forests. Along the way, he analyzes how corporations promote their interests by manipulating science and invoking the discourses of sustainability and social responsibility. Based on two decades of anthropological research, this book is comparative in scope, showing readers how similar dynamics operate in other industries around the world.